That was his nice way of asking that I not use this night to experiment with something like cauliflower crust pizza–though he really does love that one–or pull out the quinoa. 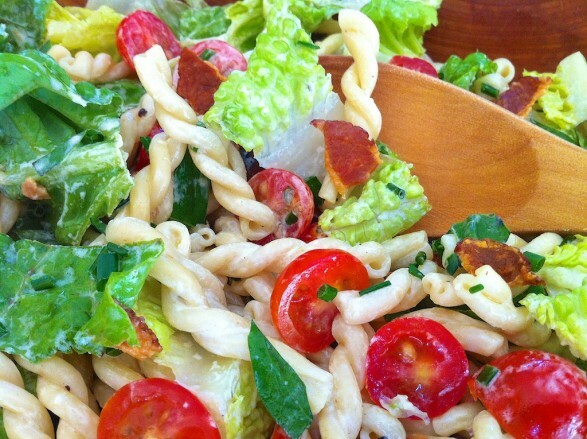 Since John’s favorite sandwich is a BLT and he adores ranch dressing, I decided a BLT ranch pasta salad would be just the thing–delicious with both kid and adult appeal. When asked if there was anything else he wanted to munch on, his one request was a fruit rainbow like I had made for his brother’s last birthday. That should balance out the burgers and bacon, right? While you can use your favorite ranch dressing in this recipe, I love my light but very flavorful Better-For-You Ranch. It can be made ahead and will keep a week or more in the fridge. I also like to cook the pasta and bacon in advance–even the day before. This makes for quick and easy last-minute assembly. Feel free to use whole wheat pasta; rice noodles are a great gluten-free option. Add grilled or rotisserie chicken to turn this into a satisfying main course. Hmmm, a little chopped avocado would be awfully nice, too! 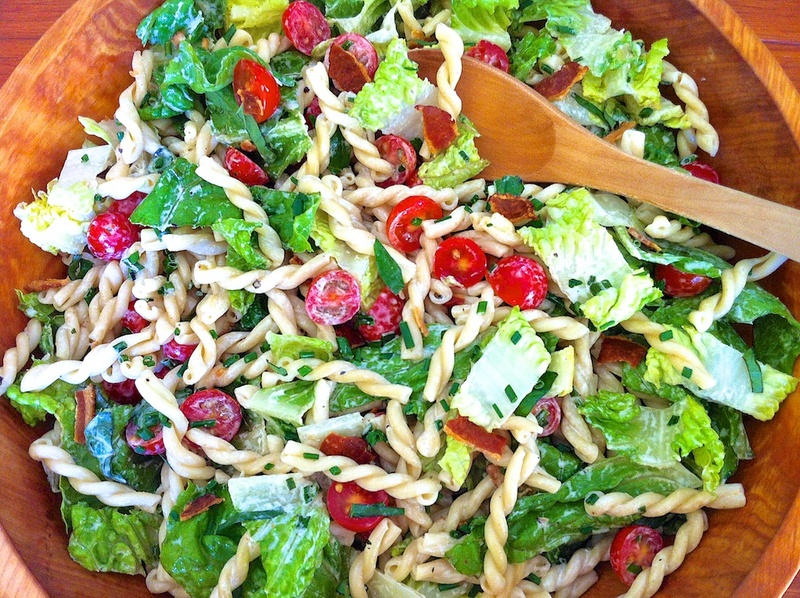 In a large bowl, combine pasta, tomatoes, romaine, and green onions. Pour the ranch dressing over top and toss well. Prior to serving, toss and add another drizzle of dressing, if desired. Add crumbled bacon and serve immediately. In season, fresh basil is a wonderful addition, either as a garnish or mixed throughout the salad. I like to cook the pasta ahead of time and, after draining, toss with a tablespoon or two of olive oil and a sprinkle of freshly ground pepper and kosher salt. Cover and store in the refrigerator until ready to finish prepping the salad. This makes the preparation very easy and ensures that the pasta does not absorb too much of the dressing before you are ready to eat. In season, add a little chopped basil as a garnish or mix more liberally throughout the salad for a burst of fresh flavor. This recipe makes enough for a good-sized crowd and can be cut in half easily. This sounds so refreshing and with the pasta, it’d definitely be enough for a meal! Thanks for sharing! Gorgeous salad! I love the flavors, too!! What a delicious salad! I bet they all loved it! Thanks for sharing this with Summer Salad Sundays, look forward to seeing you again soon! You are welcome…it was my pleasure and I look forward to seeing more great recipes over your way! what is your recipe for your “Better-for-you” Ranch dressing? Just made this salad for the first time and it was a hit! My kids loved it, even my 7 year old who I can’t get to eat any veggies. The entire salad bowl is gone!! Thank you so much for posting this!!! Since summer is almost over this will be great for football Sundays! Nice and easy so I can enjoy the games. Thank you, Dona! I hope you enjoy! Thank YOU for the thoughtful comment, Beverley!! Made for dinner tonight and it is a hit! I had to use shell pasta, since it was all I had. I think I’d like gemelli better though. We have a lot left , so I’m hoping it will be good for lunch tomorrow. Glad you enjoyed, Mary Lou, and I hope you get a few good lunches out of it! We both had for lunch Friday, but it was not as good leftover. I think next time I will have the recipe, or make it when we have company or to take to a potluck.